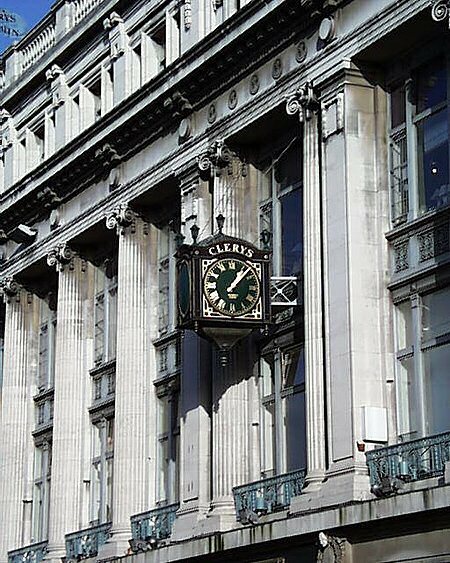 A Dublin landmark – opposite the General Post Office on O’Connell Street, Clery’s has for generations being a Dublin and indeed Irish tradition – meeting under the clock being a favorite place for couples down through the years. 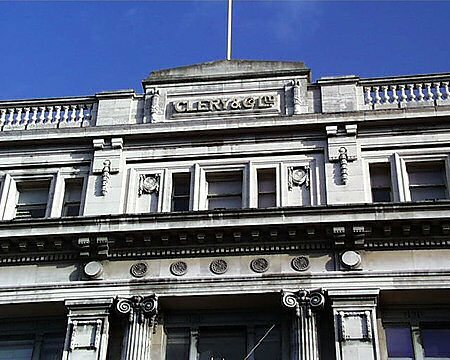 The second Clery’s Store on this site – the first was destroyed during the 1916 Easter Rising, it is heavily based on the Selfridges Store in London. Indeed it is reckoned that it was actually designed by the same architect – Robert Atkinson. Smaller than Selfridges, Clery’s is much more monumental with a giant classical row of columns above continuous uninterrupted shop windows set in large bronze frames. The interior is quite well preserved containing its original bifurcating staircase leading to the first floor and columns. The store closed in mid 2015.